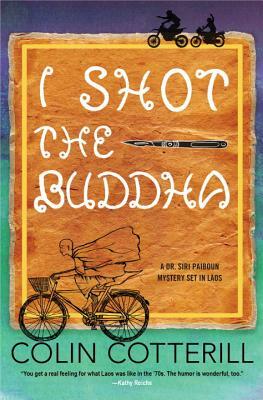 Laos, 1979: Retired coroner Siri Paiboun and his wife, Madame Daeng, have never been able to turn away a misfit. As a result, they share their small Vientiane house with an assortment of homeless people, mendicants, and oddballs. One of these oddballs is Noo, a Buddhist monk, who rides out on his bicycle one day and never comes back, leaving only a cryptic note in the refrigerator: a plea to help a fellow monk escape across the Mekhong River to Thailand. Naturally, Siri can’t turn down the adventure, and soon he and his friends find themselves running afoul of Lao secret service officers and famous spiritualists. Buddhism is a powerful influence on both morals and politics in Southeast Asia. In order to exonerate an innocent man, they will have to figure out who is cloaking terrible misdeeds in religiosity. Colin Cotterill is the author of eleven other books in the Dr. Siri Paiboun series: The Coroner’s Lunch, Thirty-Three Teeth, Disco for the Departed, Anarchy and Old Dogs, Curse of the Pogo Stick, The Merry Misogynist, Love Songs from a Shallow Grave, Slash and Burn, The Woman Who Wouldn’t Die, Six and a Half Deadly Sins, and The Rat-Catchers’ Olympics. His fiction has won a Dilys Award and a CWA Dagger in the Library. He lives in Chumphon, Thailand, with his wife and five deranged dogs. "[Siri] is the most wonderfully human of heroes." "Filled with magic and quirkiness... A madcap and international caper." "Cotterill's twisty mystery plot will entertain readers while his cast of eccentric characters charms." "Highly unusual and immensely appealing." "Dr. Siri and his misfit friends have relied on caustic humor to stay sane . . . The question is: Can his cynical sense of humor get him out of this jam?" "A gladdening complement to many mystery-reader's table . . . If you are unfamiliar with Paiboun works, it is time to crawl out of whatever cave you have been living in. This is for you." "Always delightful . . . the doctor and his profoundly eccentric friends, wife and (now former) colleagues retain their sardonic senses of humor in a vexing and sometimes scary time." "A rollicking installment . . . Guaranteed to delight fans and new readers alike."